An aura is a field of radiant light that emanates from an angel who is lit from within. People notice angel auras when angels appear on Earth in the glorious form they take in heaven (as opposed to showing up in human form). The electromagnetic energy within angels produces auras that manifest in different colors, depending on the frequency at which a particular angel's energy vibrates. Generally, the predominant color of an angel's aura is connected to the color of the main light ray within which that angel works. Blue: angels in this light ray work under the supervision of Archangel Michael on missions relating to power, protection, faith, courage, and strength. Yellow: angels in this light ray work under the supervision of Archangel Jophiel on missions relating to wisdom for decisions. Pink: angels in this light ray work under the supervision of Archangel Chamuel on missions relating to (representing love and peace). White: angels in this light ray work under the supervision of Archangel Gabriel on missions relating to (representing the purity and harmony of holiness. Green: angels in this light ray work under the supervision of Archangel Raphael on missions relating to representing healing and prosperity. Red: angels in this light ray work under the supervision of Archangel Uriel on missions relating to representing wise service. Purple: angels in this light ray work under the supervision of Archangel Zadkiel on missions relating to representing mercy and transformation. 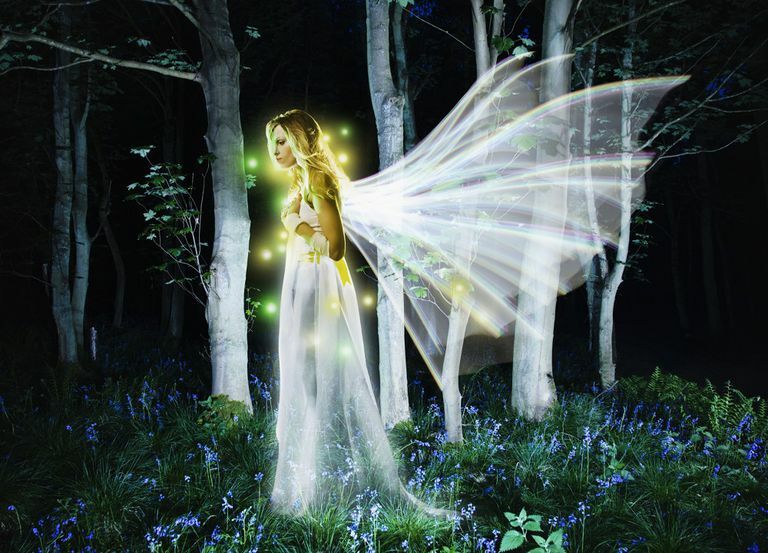 Besides the kind of work angels do, their auras show their levels of spiritual health. Holy angels have bright auras, while fallen angels have dark auras. Many holy angels have gold within their auras. Gold represents unconditional love. Many fallen angels have some black in their auras which is a sign of danger. If you see an angel with a dark aura, it's wise to test the angel's identity to figure out if you can trust it. The word "aura" comes from the Greek word "avra" which means breeze. Not only can you see angels' auras, but you can feel them. Auras express whatever emotions angels are feeling; emotional energy emanates from auras just as light does. Since holy angels often are filled with positive emotions such as peace and joy, those feelings come from their auras like a pleasant breeze blowing around them. When you see auras visually, you may see them manifest in a variety of different ways. An angel may appear to you completely, and in that case, you'll see the angel's full aura as light surrounding the angel's figure. More commonly, you may see angel auras as flashes or sparkles of light, or as cloudy mists of colored light. Auras from holy angels are often so powerful that they illuminate a large area surrounding the angels' heads. In art, auras came to be represented as halos. Halos in every kind of shape (from rings to triangles) symbolize the holiness and power of angels, made visual by the brilliant light that shines from their auras. Sometimes angel auras will feature colors that communicate specific symbolic meanings in their messages. This often happens when angels deliver messages through dreams. If you notice that a certain color stands out in the aura of an angel who appears in one of your dreams, consider the meanings of colors in dreams and then pray for a clear understanding of what that means to you and how God wants you to respond to it.